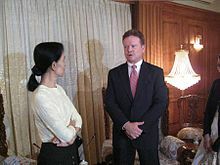 On 5 January 2012, British Foreign Minister William Hague met Aung San Suu Kyi and his Burmese counterpart. This represented a significant visit for Aung San Suu Kyi and Burma. Aung San Suu Kyi studied in the UK and maintains many ties there, whilst Britain is Burma's largest bilateral donor. During Aung San Suu Kyi's visit to Europe, she visited the Swiss parliament, collected her 1991 Nobel Prize in Oslo and her honorary degree from Oxford University. The NLD won a sweeping victory in those elections, winning at least 255 seats in the House of Representatives and 135 seats in the House of Nationalities. In addition, Aung San Suu Kyi won re-election to the House of Representatives. Under the 2008 constitution, the NLD needed to win at least a two-thirds majority in both houses to ensure that its candidate would become president. Before the elections, Aung San Suu Kyi announced that even though she is constitutionally barred from the presidency, she would hold the real power in any NLD-led government. On 30 March 2016 she became Minister for the President's Office, for Foreign Affairs, for Education and for Electric Power and Energy in President Htin Kyaw's government; later she relinquished the latter two ministries and President Htin Kyaw appointed her State Counsellor, a position akin to a Prime Minister created especially for her. The position of State Counsellor was approved by the House of Nationalities on 1 April 2016 and the House of Representatives on 5 April 2016. The next day, her role as State Counsellor was established. 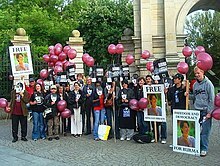 ^ "Burma extends Suu Kyi detention". Bangkok Post. 27 May 2006. ^ The line in question is Schedule Four of the 2008 Constitution (Form of Oaths or Affirmation), which states: "After being elected as an MP, I do solemnly swear to preserve, protect, and nurture the Constitution while following the nation's laws." (ကျွန်ုပ် ... ���ည် လွှတ်တော်ကိုယ်စားလှယ်အဖြစ်ရွေးချယ်ခံရပြီးဖြစ်သဖြင့် နိုင်ငံတော်ဖွဲ့စည်းပုံအခြေခံဥပဒေကို ထိန်းသိမ်းကာကွယ် စောင့်ရှောက်ပြီး နိုင်ငံတော်၏ ဥပဒေများကိုလည်း လိုက်နာပါမည်။), officially translated as: "I do solemnly and sincerely promise that as an elected representative of the Hluttaw, I will uphold and abide by the Constitution of the Union."